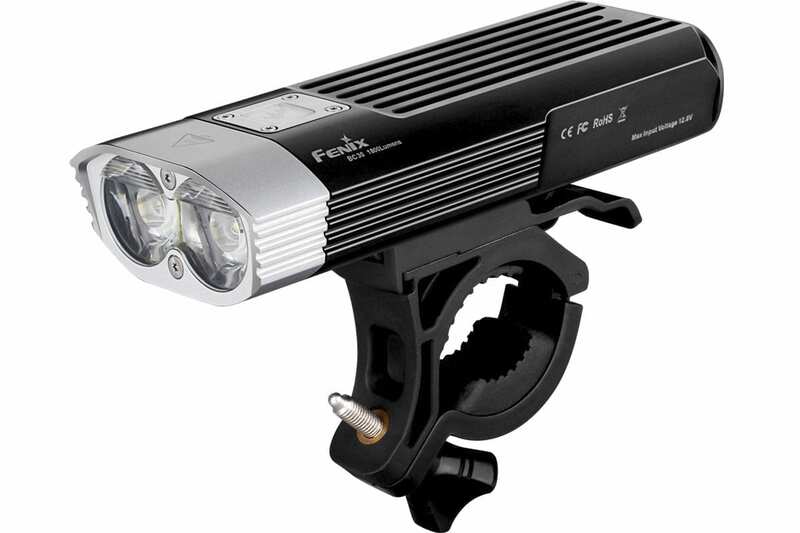 See everything in your path with this bright, 1800 lumen bike light. This compact light is versatile to handle any situation with it’s six brightness levels. Power this light with either four CR123A batteries or two 18650 rechargeable batteries. Bright light provides excellent visibility. High beam flash button is a lifesaver to warn off oncoming cars from cutting me off. Excellent light. It’s tough these days to find a light that isn’t 30 minutes of usb recharging. I like that this uses 18650 rechargeable batteries. That makes it very convenient. I like too that it uses CR123A batteries, meaning it can be used in cold weather (I fat bike in Minnesota, and a light that doesn’t function well below 0F, and most usb lights don’t, is a light that can’t be used. I have found it to be very durable (haven’t yet had any issues with the pull ring on the battery case). It has a great light pattern. I’ve not felt the need to mount and use the burst mode, which I think is more of a sales gimmick than something that’s actually useful, but to each their own! Excellent bike light! Size, cost, output and runtimes are all really good. The remote pressure switch is incredibly useful for warning distracted people/drivers when riding in the dark. My one complaint is that you have to use a lot of force to get it off the mount and then it suddenly shoots off with no warning. This has caused me to rip off the cable for the remote switch once so I had to buy a new remote switch. And several times it has dropped to the ground (with no damage, fortunately). Make no mistake that this is a great light. As mentioned already the metal clip on the battery case is a joke. I’ve used my light only a couple times and it has already come off. I called customer service and was told there are no plans to change the design. I may just drill a hole through the metal tab the clip attaches to and slip a key ring through then just twist the key ring to pull the batteries out. You’d think Felix could make and easy fix for this. I really like this light. Very solidly built and very bright. Unfortunately, there is a single fatal flaw. The battery case is pulled out by a metal clip at the end. This clip easily comes off. Even when attempting to remove or to lock the battery case, it has a tendency to come off. I have mentioned this to Fenix but got no response. Today, I found that I have lost the clip. It must have dropped off during one of my recent rides. Without that clip, I will have great difficult to remove the batteries for charging! Bought for trail riding and with the recent time change used the light for an unconventional task, mowing my lawn. If the light is good enough for riding trails at 10-15 mph, it would be good enough for walking. Attached to the cross bar and allows me to work into the early evening. Plan on using when blowing snow this winter or snowshoeing. Highly recommended! Solid bit of kit. Works great for riding into the evening on a trail with excellent output (and level control) and good run time. Use this on your bars and a smaller lamp on your head to get a great trail combo.